This U.S. Navy Honorable Discharge Lapel Pin is the official pin for Navy veterans that were honorably discharged from service in the United States Navy. The pin is 9/16" in diameter, has an Eagle in front of an anchor in bronze in the center. 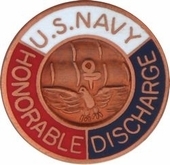 The outer edge is a circle with three colored sections with bronze lettering, white with U.S. Navy, red with Honorable, and Blue with Discharge.